The AMA reported this afternoon that Senator Jim Beall will withdraw SB 350, pending result of the University of California-Berkeley safety study which I’ve heard is just getting going. This is great news. The bill was poorly written and extremely vague, and while I’d support a well-written bill, I’d prefer things just stay the way they are – at least with regard to lane splitting. We are pleased that Sen. Beall’s office is withdrawing the bill, but we remain watchful of any legislative action on lane-splitting that could penalize motorcyclists. Lane-splitting has been done safely in California for decades, so there is really no need to impose new restrictions, especially given the guidelines just released by the California Highway Patrol that make no mention of a three-lane minimum. Lane-splitting by motorcyclists, when done correctly, helps improve traffic flow for everyone on the road,” Haris said. “That helps everybody save time, gas and hassles, and promotes safer roads by mitigating traffic backups. 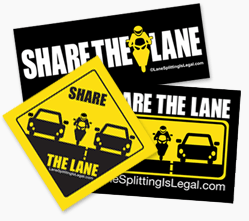 It’s important that we work to preserve lane-splitting for the benefit of everyone on the road. I’m glad to see this kind of language from the AMA, and hope it represents a shift on their part to a more pro-lane sharing stance. This can only help in states like Oregon, where there’s currently a bill to legalize lane splitting (SB 541). You can help by joining ABATE or the AMA. If you’ve blown all your money on carbon fiber or chrome farkles, at least sign up for alerts here (ABATE) or here (AMA) and of course stay tuned here, or follow the LaneSplittingIsLegal.com Facebook page or Twitter account. ABATE of California – who has a lobbyist working with Senator Beall – has issued an update on SB 350 via their Facebook group that contradicts the AMA’s “bill is being withdrawn” language. Per the Senator’s staff — Contrary to the AMA’s announcement, SB350 has not been withdrawn, rather it’s now a 2-year bill. This means that while it may be possible that the bill is heard in April (April is the deadline for submission to the Senate Trans Cmt for all policy making bills); the likelihood is that it won’t be heard by Committee until next January 2014. Good news for us, gives us plenty of time to work with our constituents to make certain the bill that is finally submitted will be a GOOD bill! This was confirmed by email shortly after the post to the Facebook group. So it appears the bill is not withdrawn, but we riders may have substantially more time to get involved and influence the direction of the bill – which I suppose that could potentially include the bill being withdrawn. So the “get involved” links above are even more important than they were a few hours earlier today, when I first wrote this post. Any details on what the Berkeley study covers exactly? I’ll definitely share more details as I have them. 1 Pings/Trackbacks for "California Lane Splitting Bill SB 350 To Be Withdrawn – Or Not?"